In his wickedly brilliant first novel, Debut Dagger Award winner Alan Bradley introduces one of the most singular and engaging heroines in recent fiction: eleven-year-old Flavia de Luce, an aspiring chemist with a passion for poison. It is the summer of 1950--and a series of inexplicable events has struck Buckshaw, the decaying English mansion that Flavia's family calls home. A dead bird is found on the doorstep, a postage stamp bizarrely pinned to its beak. Hours later, Flavia finds a man lying in the cucumber patch and watches him as he takes his dying breath. For Flavia, who is both appalled and delighted, life begins in earnest when murder comes to Buckshaw. I wish I could say I was afraid, but I wasn't. Quite the contrary. This was by far the most interesting thing that had ever happened to me in my entire life. 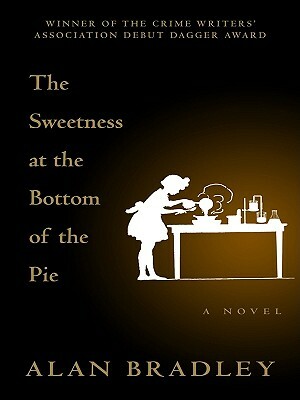 An enthralling mystery, a piercing depiction of class and society, The Sweetness at the Bottom of the Pie is a masterfully told tale of deceptions--and a rich literary delight. From the Hardcover edition.